During the Great Recession of 2008, work dried up for New Haven, Connecticut–based firm Newman Architects. To survive, it had to secure work by partnering with firms in other cities. Collaboration meeting about the Yale University Center for Teaching and Learning project, led by project manager Howard Hebel. Courtesy Newman Architects. Partnering with other firms isn’t possible without a technical solution for sharing the work. At first, Newman would keep the project until the design-development phase was over and then hand it off to the partner firm for the construction-document and construction-administration phases. But that collaboration method was disjointed. The software also helped Newman expand the types of projects it does and land big jobs it couldn’t win alone as a midsize firm. “We’ll team up with architects who specialize in building types like stadiums or something as specific as nursing schools to compete on those projects,” Gonzales says. Rendering of the Fairfield School of Nursing in Fairfield, Connecticut. Courtesy Newman Architects. 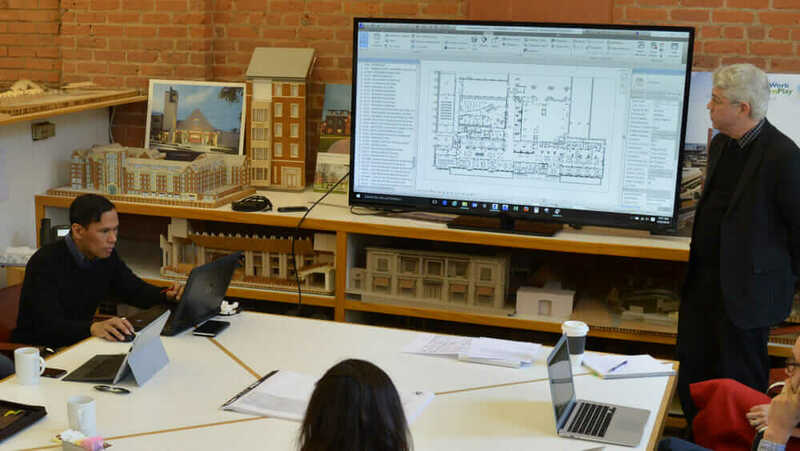 Cloud-based collaboration even changed the culture of the firm, improving the work-life balance for architects and employees. “It allows you to work from anywhere you have a high-speed Internet connection, whether that be the job trailer or your home,” Cap says. This flexibility prompted the firm to replace desktop computers with laptops for all their employees so they can work from anywhere. It also eliminates the need for colocation. 3D drawing of the Hotchkiss School in Lakeville, Connecticut. Courtesy Newman Architects. “Being able to work from home helps with the morale of our firm,” Cap says. “Having the flexibility to work from home after dinner, for example, is great. A lot of people like to do work after the kids are in bed, and with the technology we have, they don’t have to come into the office to be able to do that.” And because many of the firm’s projects are out-of-state, cloud-based collaboration also cuts down on travel costs. It has even had a positive impact on the construction-administration phase because it is easier to issue revisions to the drawings as changes come up during construction. “If you have high-speed Internet on the job site, and you go out there with a notebook, you can access the model from there and issue [new] sketches,” Gonzales says.